The right dish: Use a sturdy dish with tall straight sides or thick ceramic or porcelain ramekins for the best results. Beating the egg whites: Properly whipped egg whites are the key to whether a soufflé rises or falls. Make sure they form stiff satiny peaks before folding them into the base. Gently, gently: Fold the egg whites carefully to incorporate as much air as possible. Don't peak: Don't open the oven door during the first 20 minutes of baking or you could risk a collapse. Serve immediately: Soufflés begin to deflate as soon as they are removed from the oven. Make sure your guests are waiting for the soufflé, not the other way around. Sure, soufflé has a reputation. The diva of egg dishes, it has become the French delicacy most recognized for being fussy and difficult – the last thing one wants when juggling all the details of an Easter meal for 10. The notoriety is not entirely unearned – soufflés tend to demand an eye for detail – but adventurous cooks will find them easier to make than one might expect given the media attention to its occasional tantrums. Besides they taste wonderful whether they reach their full height potential or not. With a few rules and a gentle approach, savory or sweet soufflés can make a dramatic addition to brunch. Soufflé has been on the dessert menu at Beverly’s at the Coeur d’Alene resort since the restaurant opened. Executive Chef Jim Barrett says the huckleberry, chocolate and Grand Marnier puffs are the second-best selling dessert. Barrett also offers soufflés infused with seasonal fruits, and he’s still perfecting a Dungeness crab soufflé served with a lobster bisque sauce. “It’s pretty rare to see them (on a restaurant menu) because they are pretty time-consuming and they have to be prepared to order. They just start falling as soon as they come out of the oven, so it is very tricky to time them,” Barrett says. They have a system for cooking and delivering the hot desserts, served with crème anglaise, but they still have disaster every once in a while. “Occasionally, they fall on us from just setting them down too hard, or overbaking them, or underbaking them,” Barrett says. The key to making sure they’re perfectly baked is to watch the soufflé as it rises up over the rim of the soufflé dish or ramekin. When they’re underbaked, the soufflé still has the glossiness of raw whipped egg whites. As soon as the soufflé dries out and loses the glossy appearance is when they’re baked just enough, Barrett says. Some cookbooks recommend inserting a skewer horizontally into the side of the soufflé. If it comes out clean, the soufflé is done. 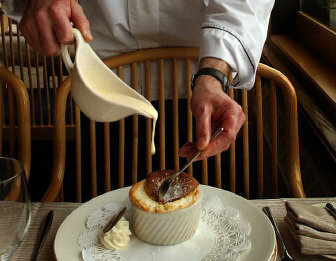 At the restaurant, servers know when a soufflé comes out of the oven it must be taken to the table immediately. The same holds true if you make them at home. They should go straight from the oven to a waiting guest. Barrett also recommends using a heavy ceramic dish. Thin ramekins or soufflé dishes can transfer heat too quickly to the soufflé. At Beverly’s they spray the ramekins with vegetable oil and sprinkle them with sugar to provide traction for the rising soufflé. For savory soufflés, the dishes can be sprayed with oil and then coated with a bread crumbs or cheese. All soufflés start with an intensely flavored base – a béchamel, custard or fruit puree. Then the base is lightened with whipped egg whites. Whipping the eggs and then folding them into the base is one of the tricky parts of soufflé baking. Here are some tips for perfectly whipped eggs from cookbook author Marie Simmons. Her James Beard award-winning book, “The Good Egg,” was recently released in paperback. “ Use room temperature eggs. Eggs taken from the refrigerator can be warmed in a bowl of hot tap water for 10 minutes before separating. Separate carefully. Be careful that no yolk gets into your whites. The fat inhibits whipping. “ Clean bowls and beaters. Be sure there is no fat, oil or grease on your bowl or utensils. Don’t use plastic bowls to whip egg whites because they retain grease. Add a pinch of cream of tartar to help stabilize the egg whites so they won’t lose their volume. “ Use an electric mixer. Start with low to medium speed until they are foamy and then increase the speed to high. If the eggs are not beaten properly, the soufflé will not rise. Perfectly beaten egg whites form stiff peaks with a “smooth, satiny sheen.” Underbeaten eggs have a dull, airy look. Overbeaten eggs look curdled and clumpy. The final step is to carefully fold the beaten egg whites into the soufflé base. Most recipes call for folding a portion of the egg whites into the base first to lighten it and then folding in the remaining whites. Use a freshly washed and dried plastic spatula. To fold: Gently cut the spatula down the center of the bowl and up the side, turning the bowl with your other hand as you cut down the center again with the spatula. Take care not to deflate the egg whites. Soufflés need to be served quickly, but they need not be prepared entirely at the last minute. In most cases the base of the soufflé can be prepared ahead of time and held in the refrigerator in an airtight container for a couple of days. In the recipe below from Cooking Light’s April issue, the Double Chocolate Soufflés with Warm Fudge Sauce can be prepared ahead and frozen until ready to cook. They go straight from the freezer to the oven. The sauce can be prepared ahead as well. This classic spinach soufflé from “The Good Egg,” by Marie Simmons, is often made with grated Swiss cheese, but freshly grated Parmigiano-Reggiano is even better, Simmons says. It produces a lighter and more intensely flavored soufflé and complements the spinach. Cheddar, Gruyere or another semihard cheese can be substituted for the cheese. Position a rack in the center of the oven and preheat the oven to 400 degrees. Generously butter a 6- to 7-cup soufflé dish or ramekins. Sprinkle lightly with cheese or bread crumbs, shaking the dish to coat evenly. If using fresh spinach, steam in a steamer basket set in a saucepan over 1 inch of boiling water until wilted, about 3 minutes. Drain and let cool, then drain in a strainer, squeeze out the liquid and finely chop the spinach. You should have about 1 cup. If using frozen spinach, cook it according to package directions, let cool and squeeze dry. Press the spinach between layers of paper towels to remove more moisture. If it is coarsely chopped, chop it fine and set aside. Melt the butter in a small saucepan over low heat. Add the flour and cook, stirring constantly, for 3 minutes. Gradually whisk in the milk and bring to a boil, stirring constantly. Cook for 3 minutes more. Add the salt, a grinding of pepper and nutmeg to taste. Remove from the heat. In a large bowl, whisk the egg yolks until blended. Whisk in a little of the white sauce to temper the eggs; then add the remaining sauce, whisking until blended. Stir in the spinach and cheese. Place the 4 egg whites in a large bowl, add the cream of tartar and beat slowly with an electric mixer until soft peaks form. Increase the speed to high and beat until the peaks are stiff and smooth. Using a rubber spatula, transfer about one-third of the egg whites to the spinach mixture and gently fold in until blended. Add the remaining whites to the spinach mixture and gently fold in until blended. Pour into prepared dish(es). Put the soufflé(s) in the oven and reduce the temperature to 375 degrees. Bake until the soufflé is puffed and golden, 30 to 35 minutes for a soufflé dish and about 20 to 25 minutes for ramekins. If you like your soufflé firm in the center bake it for 5 minutes more. Variation: To make a Spinach, Dill and Feta Soufflé, omit the nutmeg and substitute 1/2 cup crumbled feta cheese for the Parmigiano-Reggiano and use bread crumbs to coat the soufflé dish(es). Add 2 tablespoons chopped fresh dill to the soufflé base along with the spinach. Approximate nutrition per serving: 268 calories, 17.9 grams fat (9 grams saturated, 59 percent fat calories), 16 grams protein, 12 grams carbohydrate, 198 milligrams cholesterol, 1.9 grams dietary fiber, 250 milligrams sodium. From www.epicurious.com. This recipe originally appeared in the May 2001 issue of Bon Appetit magazine. Preheat oven to 350 degrees. Butter six 3/4-cup soufflé dishes. Place 1 tablespoon Parmesan in each dish; rotate dishes to coat with cheese, leaving excess in dishes. Place dishes on baking sheet. Whisk milk and yolks in bowl to blend. Melt butter in saucepan over medium-high heat. Add onion, thyme, and rosemary; sauté 3 minutes. Add flour; whisk 1 minute. Whisk in milk mixture. Whisk soufflé base until thick and bubbling, about 2 minutes. Remove pan from heat. Add 1/2 cup goat cheese, salt, black pepper, and cayenne pepper; whisk until cheese melts. Beat whites in bowl until stiff but not dry. Fold 1/4 of whites into base in pan. Sprinkle remaining 1/2 cup goat cheese and 1 tablespoon Parmesan over. Fold in remaining whites in 2 additions. Divide mixture among dishes. Bake soufflés until puffed and beginning to brown on top, about 20 minutes. Serve immediately. Approximate nutrition per serving: 250 calories, 18 grams fat (11 grams saturated, 66 percent fat calories), 15.8 grams protein, 5.7 grams carbohydrate, 145 milligrams cholesterol, less than 1 gram dietary fiber, 675 milligrams sodium. You can prepare the ingredients ahead, spoon the batter into soufflé dishes, cover, and freeze until you’re ready to cook them. They can go straight from the freezer to the oven. Make the sauce ahead, too, and simply warm it before serving. This recipe received the Cooking Light Test Kitchens’ highest rating. It appears in the April 2006 edition of the magazine. Position oven rack to the lowest setting, and remove middle rack. Preheat oven to 425 degrees. Place egg whites in a large mixing bowl; beat at high speed with a mixer until stiff peaks form (do not overbeat). Gently fold one-fourth of egg whites into chocolate mixture; gently fold in remaining egg white mixture. Gently spoon mixture into prepared dishes. Sharply tap dishes 2 or 3 times on counter to level. Place dishes on a baking sheet; place baking sheet on the bottom rack of 425-degree oven. Immediately reduce oven temperature to 350 degrees (do not remove soufflés from oven). Bake 40 minutes or until a wooden pick inserted in the side of soufflé comes out clean. Approximate nutrition per serving (1 soufflé and about 2 tablespoons sauce): 315 calories, 9 grams fat (5.1 grams saturated, 26 percent fat calories), 9 grams protein, 51 grams carbohydrate, 41 milligrams cholesterol, 2.9 grams dietary fiber, 153 milligrams sodium. This recipe from “The Gourmet Cookbook” was based on the apricot soufflés served by Sally Darr at her former New York City restaurant, La Tulipe. This recipe calls for five large egg whites. When separating your eggs, save the yolks for the accompanying crème anglaise. To make the apricot soufflé: In a heavy saucepan simmer apricots, water, and 1/2 cup sugar, covered, 20 minutes. Transfer hot mixture to a food processor and purée until very smooth. Force purée through a fine sieve into a bowl and stir in lemon juice, rum, vanilla, a pinch salt. Cool purée completely. Purée may be made 2 days ahead and chilled, covered. Bring to room temperature before proceeding. Transfer purée to a large bowl. Preheat oven to 350 degrees. Generously butter six 7-ounce (3 1/2- by 1 3/4-inch) ramekins and coat with additional sugar, knocking out excess. In another large bowl with an electric mixer beat whites with pinch of salt until foamy. Beat in cream of tartar and beat whites until they hold soft peaks. Beat in remaining 1/4 cup sugar, a little at a time, and beat meringue until it just holds stiff peaks. Whisk about one-fourth of the meringue into purée to lighten and fold in remaining meringue gently but thoroughly. Ladle batter into ramekins and bake soufflés on a baking sheet in middle of oven 20 to 25 minutes, or until puffed, golden brown, and just set in center. Remove ramekins from oven. With 2 forks pull open center of each soufflé and pour some crème anglaise into each opening. Serve soufflés immediately. To make the vanilla rum crème anglaise: In a small heavy saucepan bring half-and-half just to a boil with vanilla bean and remove pan from heat. Scrape seeds from bean with a knife into half-and-half, reserving pod for another use if desired. In a bowl whisk together yolks, sugar, and a pinch of salt and whisk in hot half-and-half in a stream. Return custard to pan and cook over moderately low heat, stirring constantly with a wooden spoon, until thickened (170 degrees on a candy thermometer), but do not let boil. Pour sauce through a fine sieve into a bowl and cool, stirring occasionally. Stir in rum. Chill sauce, covered, until very cold, at least 2 hours and up to 2 days. Note: Gourmet editors recommend dried California apricots rather than the more common Turkish or Mediterranean apricots. They can be found at some specialty stores and online at www.apricot-farm.com. Approximate nutrition per serving: 409 calories, 12 grams fat (6.7 grams saturated, 27 percent fat calories), 9 grams protein, 61 grams carbohydrate, 217 milligrams cholesterol, 3.6 grams dietary fiber, 96 milligrams sodium.